Non-tariff barriers (NTB’s) and Non-tariff measures (NTM’s) constitute a really significant chapter of the international economics’ theory. According to the theory, NTB’s are considered to cause deviations from the ideal scenario of laissez-faire and trade liberalization among different countries. However, the recognition, estimation and identification of NTB’s of the Greek economy are a rather difficult process, as a lot of individual characteristics must be taken into consideration. Generally speaking, seaborne trade covers an extremely large part of both worldwide and Greek international trade. 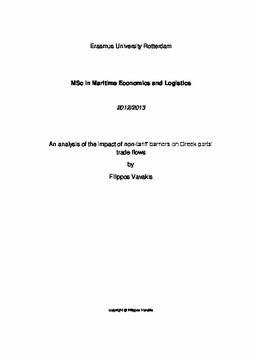 The exchange of trade flows to/from the Greek ports certifies the importance of Greek ports as trade and transport flows’ gateways. That’s why the Greek ports can be considered as connecting points of Greece with the countries abroad. For the sake of this analysis, the author has distinguished the following categories of NTB’s; government intervention on seaborne trade (incl. taxes, subsidies, quotas), restrictive practices in shipping (incl. maritime employment and environmentally friendly shipping), technical barriers to trade, road and maritime transport, retail and distribution costs and time costs (incl. congestion). The Global Simulation Model (GSIM) is used to assess the impact of NTB’s to Greek trade flows, as well as to the micro-economic performance of Greece. Given the fact that the ports are the gateways of Greece with the outside world, it is obvious that these effects on Greek international seaborne trade also affect the Greek port and maritime industry. Two different scenarios are analyzed; the current scenario (2008-2011) and the future one. After describing each scenario in an analytical way, the NTB’s tariff equivalents are calculated and inserted in indexes. The current model will be also adjusted so as to provide outcomes for four different categories of cargo (Containers, Dry Bulk, Liquid Bulk and Ro-Ro). According to the outcomes of the GSIM model, the initial hypothesis that the Greek ports’ throughput value will incur positive rates of growth comes true. It must be also referred that all the largest Greek ports can incur significant rates of export value growth above 10%. Since the removal of NTB’s increases competition by offering better prices and freight rates for the consumer, it can be easily referred that the consumer surplus increases, whereas the producer surplus remains stable. As a a fact, the ports of Heraklion and Piraeus appear significant exports’ value growth. These ports could have been benefitted by the relatively larger containerization shares. On the other hand, the ports of Patras, Volos and Igoumenitsa appear the largest growth rates of cargo volumes, although they are based on subsidies to increase their income. Last but definitely not least, the Greek ports appear significant perspectives for developing and increasing their trade and transport flows. Despite the existence of growth in both Containers and Ro-Ro, Greeks appear huge competitive advantage in carrying liquid and dry bulk cargo, probably because of their tradition in bulk shipping, oil and gas carriage. In order to achieve this target, the Greek ports could move towards more efficient practices in shipping. Characteristic examples of these practices include public-private partnerships, corporatization of port authorities, labor efficiency practices and investments in infrastructure.